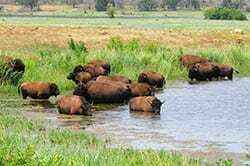 The annual public auction of native bison will begin at 12:00 noon at the Wichita Mountains Wildlife Refuge. The Friends provide logistical support for the refuge in many capacities. Come out and join the celebration. The auction is held at the main refuge corrals, immediately north of Refuge Headquarters, 12 miles north of Cache, Oklahoma.